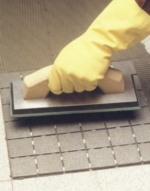 To set most ceramic tile you will need to purchase thin set. Thin set is available by the bag and looks similar to cement. Make sure to buy enough for the entire installation. Most stores will take back unopened bags, so do not be afraid to overbuy. Once I start the installation, how much time do I have before I finish it? The thinset takes a long time to solidify: usually between 2 and 4 hours. Of course, you will do little areas one at a time, so there's no need to hurry. Mix the thin set in a five gallon bucket by adding water and stirring to a thick pasty consistency. If you wish to use power mixer, make sure it is slow speed. Do not use a drill. Mixers can be rented at most rental supply yards. Believe me it's worth the extra few dollars. Once the thin set is mixed, trowel it over the area where the tile will be set. Trowel only enough for an area that you can safely reach on your knees. Use a notched trowel and run the trowel so that the rows left in the thin set are in a straight line. DO NOT use a circular pattern. 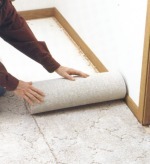 Place the ceramic tile into the thin set with a slight downward pressure. Take a rubber mallet and lightly tap the tile to assure good coverage. Work in small sections and take your time. 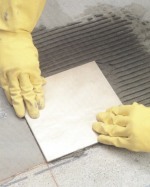 Keep an eye on the thin set, if it gets too dry, it may be necessary to add more water and remix. 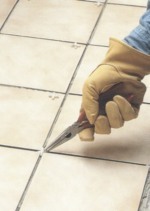 If the thin set comes up between the grout joints, remove it before it dries. Lay all the full tile first and leave the cut tiles until last.